Mental illness is an illness of the mind. For someone who has a mental health problem, they lose some of the control over their thoughts and feelings. There are many different types of mental illness and they can affect people in a variety of different ways. They can be mild or severe depending on the illness, person, age, environment. Mental ill health often makes everyday things difficult to do. Mental health affects 1 in 4 people at some point in their lives so it is likely that at some point either you or someone you know will suffer from mental ill health. For some children, they grow up with a parent or parents who have mental health difficulties. The severity of the mental illness can change over time. 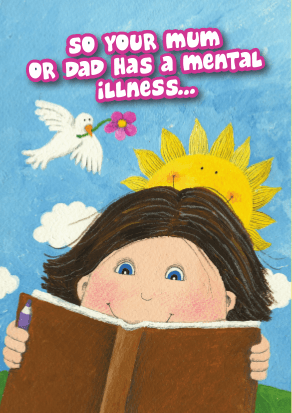 For more information and films discussing what it's like to have a parent with a mental illness click here. These difficulties may not be the experience of every child and there may be other things which are not on this list. It is an indication of some of the difficulties that children may come across when living with a parent who has a mental health problem. There are some things that can be done in order to make the child’s life easier. Being mentally ill does not automatically mean they cannot stay at home. Have another reliable, consistent adult that they can talk to, give them information and let them understand the illness and try to encourage the child to live like their peers do. It is also important to make sure the parent stays as well as possible and recognises when they are not – having a plan in place for when they are not well. It is up to you who you want to help in these situations. It can be a GP, social worker, friends, other family or other support organisations. 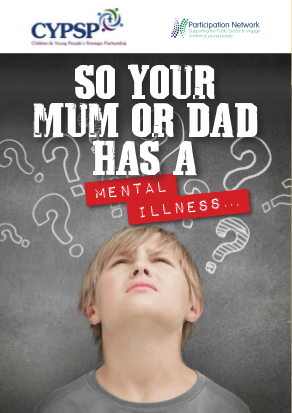 Click on the images below to download these leaflets and share the information with your child to help them understand more about what it means to have a mental illness. Click on the links below for further information on more specific areas of parental mental health. The Mums Wellness Project supports expectant mothers and mums with infants up to two years old, experiencing emotional health and wellbeing difficulties. If you are concerned about the impact your mental health is having on your child, speak to your GP or professionals working with your child, they can make referrals to the Family Wellness Project on your behalf.